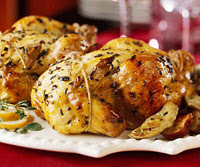 Each plump bird provides two servings in this easy meal. To serve, simply halve each hen lengthwise using kitchen shears. Preheat oven to 450 degrees F. In a large bowl, combine lemon juice, snipped oregano, olive oil, garlic, snipped thyme, salt, and pepper. Add artichoke hearts and potato; toss gently to coat. Using a slotted spoon, transfer artichokes and potato to another bowl; reserve garlic mixture. Rinse hens; pat dry with paper towels. Tie drumsticks to the tails using 100-percent-cotton string. Tie wing tips to the breasts. Brush hens with some of the garlic mixture. Arrange hens on one side of a rack in a large roasting pan. Arrange artichoke hearts and potato on the opposite side of rack. Drizzle hens and vegetables with remaining garlic mixture. Place roasting pan on middle rack of oven. Roast about 50 minutes or until juices of the hens run clear (180 degrees F) and vegetables are tender. Arrange hens on a serving platter. Using a slotted spoon, transfer vegetables to platter. If desired, garnish platter with lemon slices, oregano leaves, and thyme sprigs. Using kitchen shears or a long heavy knife, cut the string between drumsticks and around breasts. Carefully cut hens in half lengthwise. Makes 4 servings. Calories 443, Total Fat 25 g, Saturated Fat 5 g, Monounsaturated Fat 9 g, Polyunsaturated Fat 4 g, Cholesterol 120 mg, Sodium 427 mg, Carbohydrate 16 g, Total Sugar 1 g, Fiber 5 g, Protein 39 g. Daily Values: Vitamin A 0%, Vitamin C 29%, Calcium 5%, Iron 7%. Exchanges: Starch 1, Medium-Fat Meat 5. This entry was posted on 4:07 PM and is filed under Chicken . You can follow any responses to this entry through the RSS 2.0 feed. You can leave a response, or trackback from your own site.